China has urged the United States to drop measures limiting imports of Chinese products in a bid against protectionism. The US dollar could not play the long term role as the world’s single reserve currency and a more diversified global currency system should be formed. China faces a different and bigger challenge now to sustain its growth, said David Dollar, who is spending his final day today as China director of World Bank. As "border terror" threatens fair trade worldwide amid the climate of the global financial crisis, protectionism under a fresh name is never a solution to problems, experts said. Do you think China should continue buying US government debt? US Recession Good for China? China Urges New Money Reserve to Replace Dollar! 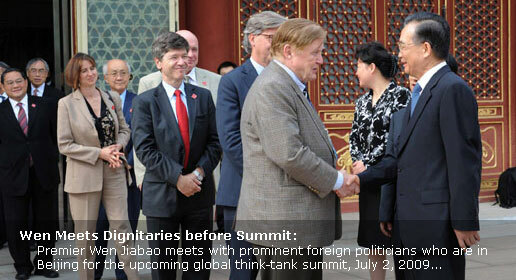 The first Global Think Tank Summit will be held in Beijing from July 2-4, where close to 100 top-notch think tanks from home and abroad will be represented, including the Brookings Institution.